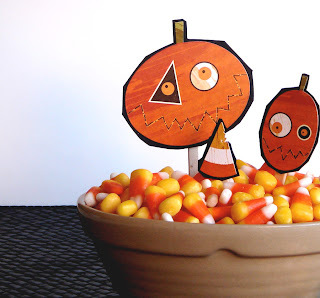 candy corn: the official food pyramid for halloween. enjoy! yesterday, i found myself in one of those "creative slumps". when that happens, this book by sara midda is one of my go-to standby's...i find this book to be a masterpiece in creativity and imagination. every time i look through this book, i notice something new. 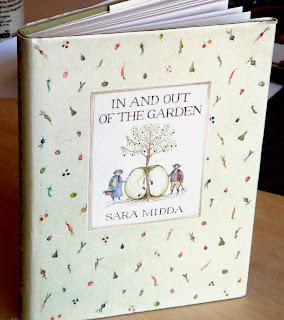 "In and Out of the Garden" took sara three years to complete, and that in itself is a lesson to me in pure determination and dedication. 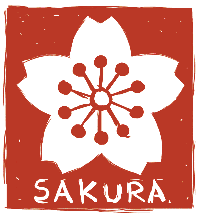 here is sara's own description of her book: "This book is a potpourri of garden lore. Here are summer days of raspberry picking, swarms of bees laden with pollen, peas ripe for podding, herbs for flavouring. Every page, including the text, has been hand painted. Dip into it for recipes, poems, proverbs and garden thoughts." 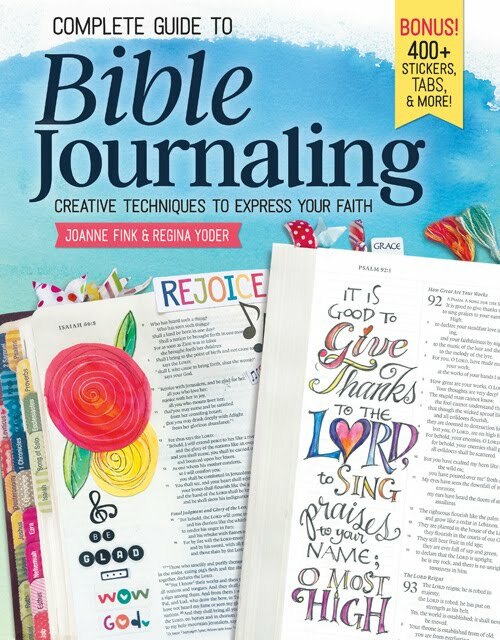 you can take a peek into this book here...enjoy! i love to shop for art supplies. i could easily spend hours in one store just looking at everything. there's so much to see! once i reach that point of "overload", i know that it's time to head to the check-out counter. the only problem with buying the supplies, is that i don't always use the supplies as quickly as i should. so...i have baskets that are overflowing with goodies that are anxiously waiting to be put towards a fun project. so, i'm bound and determined to empty that basket of supplies, and here's my first project: a simple book using two pieces of chipboard covered with scrapbook paper, a flower embellishment for the front, rub ons, and ribbon to hold it together. 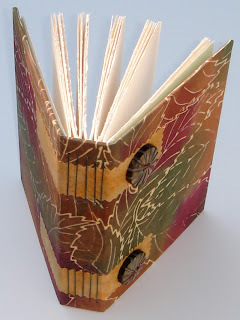 the pages inside are also a piece of scrapbook paper that have been cut into individual pages. 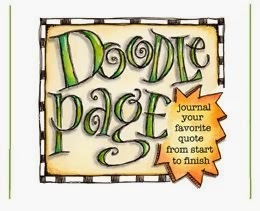 this paper is made by fancy pants, and is double sided so it's perfect for bookmaking. you can find it here at two peas in a bucket. but try not to buy too much because your supply baskets might start looking like mine! i was so excited to discover that elvie studio was mentioned on cute little michelle's blog, "so much time, so little to do..."! this has really made my day! i've met so many wonderful people through my blog and etsy, and i'm so thankful for all of you who check in with me! 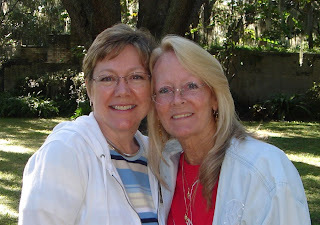 you can visit michelle at her blog here...she is recovering from gall bladder surgery and has shared some wonderful get well cards that her friends and family have made for her. she also has some sweet artwork that her children have created! 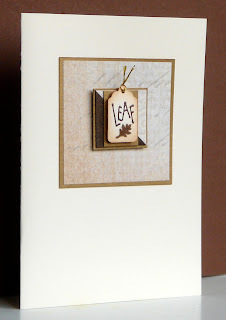 and i especially love this fun pumpkin card that she made using rubber stamps and other fun stuff! thanks again, michelle! 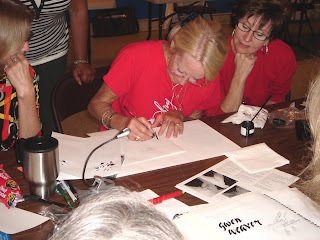 i had a GREAT time this past weekend in orlando with all of my lettering buddies at a pointed pen workshop taught by calligrapher gwen weaver. i can best describe gwen's work using just one word: FAB-U-LOUS! here is a photo of her using one of her favorite esterbrook nibs as she gives us a demo...and there's my very cute friend martha looking on! here is an example of the beautiful, delicate letterforms that gwen creates, using a nib with a point the size of a straight pin! here's me and gwen after two wonderful days of lettering, laughter and fun! after all these years, my heart still skips a beat when i see beautiful letterforms. and, i just love being with others who feel the same way. with the convenience of computer fonts, it would be easy to completely abandon the twenty years of blood, sweat and tears that i've put into this craft. but as long as there are folks out there who share my love for the alphabet, calligraphy is alive and well! thanks, gwen...please come back soon! i've been a fan of jessica, over at vol25, for quite some time, so i knew that she would be a perfect fit for "inspiration monday". 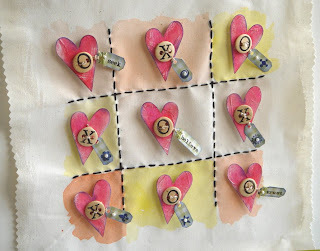 not only is her artwork colorful and fresh, i think that this is pure whimsy at it's best. and after a long day of hearing nothing but negativity in our world, jessica's artwork is exactly where i find all kinds of inspiration. let's face it...this is just plain fun! 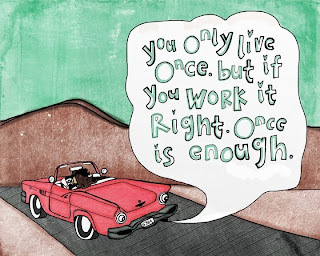 i personally would love to be that gal, driving a vintage convertible, hair blowing in the wind, looking forward to life's next challenge (and trying to get the "you only live once" part right!). 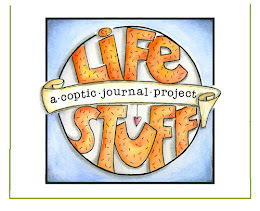 i also find inspiration in the name of jessica's etsy shop, vol25. she was 25 years old when the "doors" of her shop opened, and she thought of it as opening a new volume in her life. love it! and i know that there are a lot of others out there who are loving jessica's work...she's been featured on blogs like designsponge and decor8, just to name a few. for more inspiration and fun, please visit jessica's etsy shop here, and you can learn more about her by reading her profile here. you can also find her cute blog here. thanks, jess, for allowing me to feature you and your wonderful artwork...you truly inspire me! 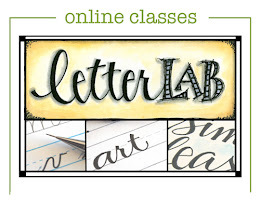 i'm on my way to orlando this weekend with my good buddy martha...we'll be taking a lettering workshop taught by calligrapher gwen weaver. ooooh, i can't wait...girl's weekend!! and, there will be plenty of chocolate, potato chips, and good ol' fashioned fun...you can count on it. i'll fill you in on the details when i get back...have a great weekend! 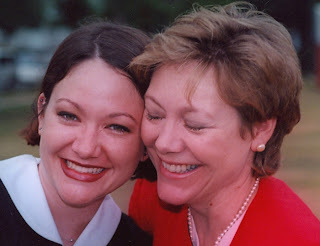 twenty-nine years ago, i became the proud mom of beautiful melissa. twenty-nine years of hugs, kisses, a few shouting matches, "discussions", our independent spirits, tears, and lots of laughter. and if the truth be known, you've taught me so much more than i've ever taught you....but, please don't tell dad that i know that! you are my sweet lissy and you are my friend, and most importantly, you are twenty-nine years of pure blessing from God. happy birthday, lissy...i love you!! 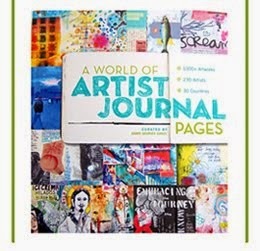 i was so excited to learn that this journal that i recently made has been included in an etsy treasury! what's an etsy treasury? here's the definition, according to the etsy blog, the Storque: "The Treasury is a member-curated gallery of short-lived lists of 12 hand picked items each. It functions as a high-demand (and pretty!) promotional tool that many devoted Etsians fight to get. The Treasury is not intended for self-promotion, but instead to acknowledge and share the many cool things for sale on Etsy." searching the treasuries is one way many etsians shop for items, usually according to theme, color, etc. 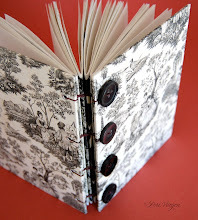 a treasury usually only lasts for three days...please click here to see the beautiful treasury that my journal has been featured in! 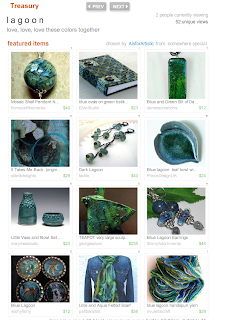 and many thanks to etsy seller AisforArtistic for including me! 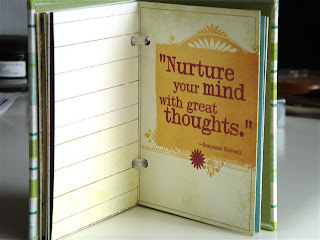 i have decided to add a weekly feature to my blog called "inspiration monday". each monday i will showcase artwork of an artist whose work inspires me for one reason or another. 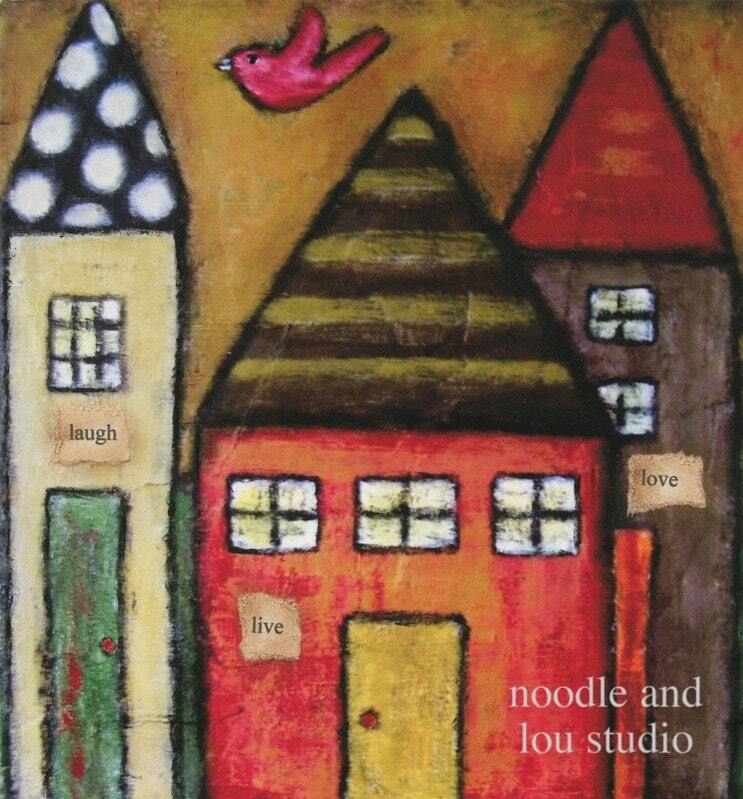 when i first came up with this idea, my mind immediately went to jenn of noodle and lou studio. her artwork is fresh, fun, colorful, vibrant, simple, and has a sense of sweetness to it that i just love. i would love to be a little mouse in her studio...how fun it would be to watch her creative process of layering papers and paint! 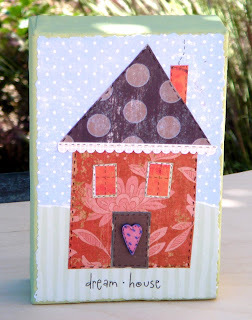 and, if you read my blog post of a few days ago, then you know how much i love this particular subject matter...houses! i could be happy living in any of these, but i must admit that i'm partial to the "laugh" house...that green and red distressed door is fabulous! jenn also creates wonderful little polymer clay houses called "lulettes" that are absolutely adorable. (click here to see the one she made for martha). i'd also like to say that i'm especially inspired by jenn herself. 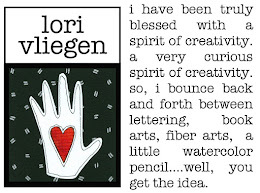 i've had the pleasure of corresponding with her, and she has a very sweet spirit that naturally comes out in her artwork. you can see more of her work at her etsy shop by clicking here. and her blog is a lot of fun, too! thanks, jenn, for allowing me to showcase your artwork...you truly inspire me! don't you just love it when you find a book that you not only like, but you also actually do some of the projects? 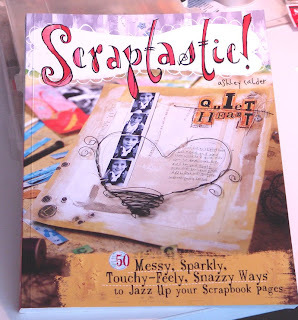 for me, "Scraptastic!" is just the book. 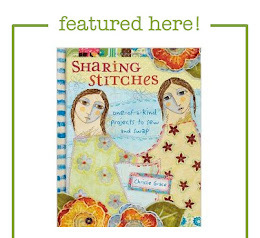 this fun book by ashley calder is filled with clever, updated techniques to work with wire, paper, fabric, paint, and other great stuff. the instructions for each project are well written, and i appreciate that many of the steps include photographs! what i really love about this book is that, while ashley has given us many specific projects, it's really more about the techniques, and you can easily adapt it to your own style. many of the pages of my copy of this book are already dog-eared, waiting for some free time to experiment and have fun! check it out here and see what you think! 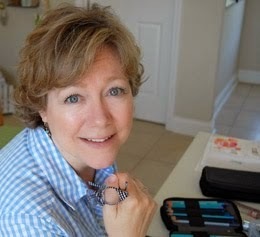 about a year ago, donna downey came to our local scrapbook store and offered several workshops. i was crazy with excitement when i found out that she'd be in town because, i must admit, i'm a huge donna downey fan. 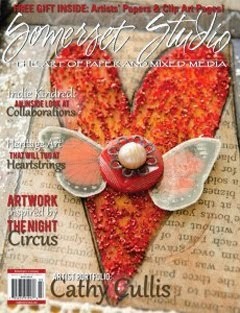 donna is a mixed media artist...she dabbles in paper, fabric, books, paint...well, you can see why i'm a fan! 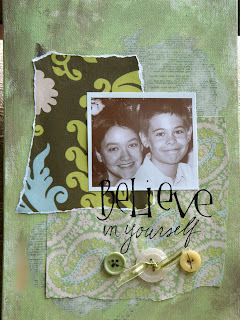 here is a photo of one of the projects that i made that weekend (i took all of her workshops but one!). this is one of my favorite pieces of art, not only because it showcases one of my favorite photos of our kids (uh, taken 12 years ago, but still my favorite! ), but mainly because i didn't think i could do it. remember, i'm "collage challenged", so i tend to run in the other direction when it comes time to making one! but, i think that my success is a testimony to what a great teacher and motivator that donna is...let me put it this way, if i can do it, anyone can do it! one of the easiest ways to become inspired is to visit etsy. before you know it, you'll have your own favorites list started. this pendant created by jean skipper, has been on my favorites list for quite some time. it's simple and it speaks to me. 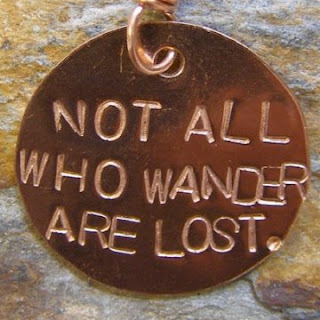 i'm inspired by this because many times i feel like i'm a wanderer, especially in my studio, but that doesn't mean that i've lost my way. i'm actually quite happy exploring new artistic avenues, trying to see just how many things can i do with paper (and fabric, and paint, and so on). it's all a journey...and as long as i've got enough chocolate bars in my backpack, i'll be out looking for new trails for quite a while! today began with overcast skies and a few rain showers...and now the sun has peeked through and we're in the midst of a beautiful florida day. i've been thinking about my fun trip to donna's (see yesterday's post) and decided to put a few "inchies" together to celebrate our great weather. i used scraps of paper, because, well, i have tons of that! 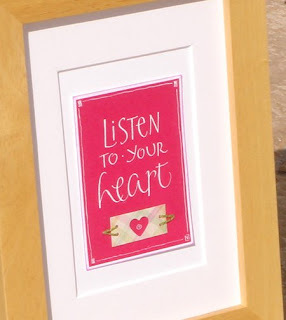 the other elements were created from a small flower punch, tiny beads and my original artwork and lettering. very fun to do, no stress, no worries, just fun happy art! martha and i took a "field trip" the other day (i say field trip because it took me out of my studio, and we went to a place that takes me an hour to drive to!). 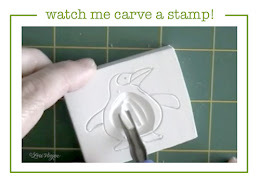 we went to see our friend donna, who owns a very sweet rubber stamp shop called a small cleverness, very appropriately named because it's very small, but filled to the rim with clever ideas and inspiration. 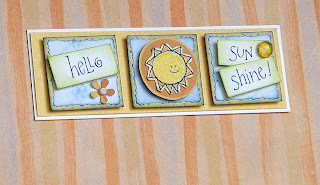 and while donna provides a wonderful selection of books, stamps, tools and paper, she's especially generous in offering her ideas and inspiration. 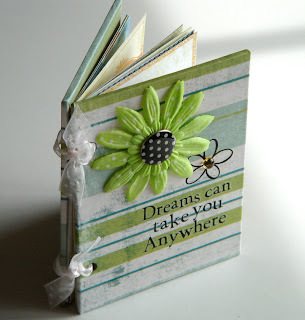 this is a photo of our "make and take"...a fun little card that uses an "inchie" as its centerpiece. 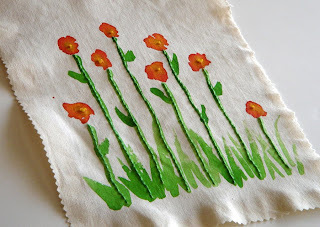 an inchie is a piece of artwork that's done on a one inch square, and i've been hesitant to start making them only because i have so many other interests. but because i love working on a small scale, i knew that i would love inchies, and i finally caved and made one. and i was right...i loved making it! now i just have to figure out how to incorporate them into my books, lettering, drawing, painting...good grief, the list goes on. i love classic. classic clothes, classic shoes, classic movies, classic cars...and, the classic color combination of black, cream and yellow. 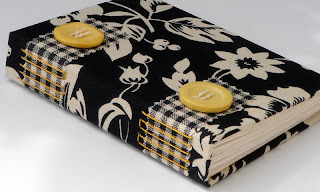 and while the main fabric on the covers of this blank journal might seem on the more traditional side, the black and cream check tabs and mismatched yellow buttons say "classic" to me. i've sewn hand-torn italian velata papers to the inside spine and just to zip it up a bit, canary yellow canson paper lines the inside covers. i try not to play favorites with my books because each one has a different story (even though they're blank). but, if i had to choose a favorite, well, keep in mind that i love classic. 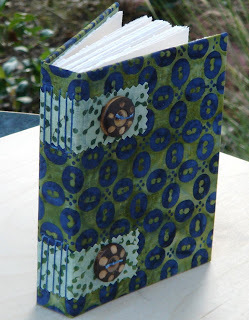 i have two small boxes that are filled with handmade books that i've made over the past few years. most of these books are models...books that i've made while just experimenting with new stitching techniques, or books that are the end result of a workshop that i've attended. 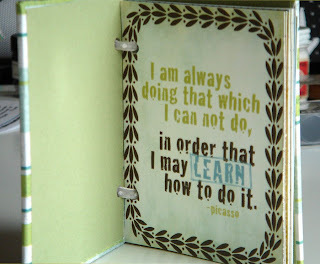 such is the case with the book that's pictured above. 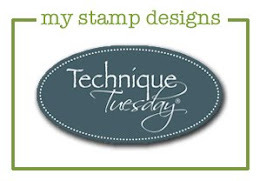 i was able to take a workshop that was offered at our local rubber stamp convention several years ago, and this was our project. 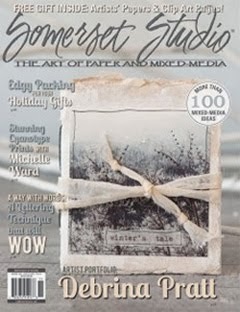 the covers are made from black polymer clay that have been dry stamped and then baked. 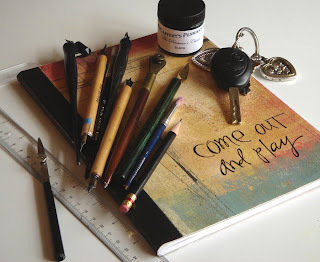 once cool, simply dry brush acrylic paints on top of the clay and your design magically appears. 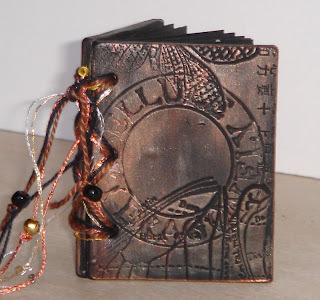 for this book, we used metallic paints, mostly bronze. we used lightweight black paper for the pages and then whipstitched it up the sides with various different threads, yarn and beads. this is a small book, measuring only 1.5" x 2". 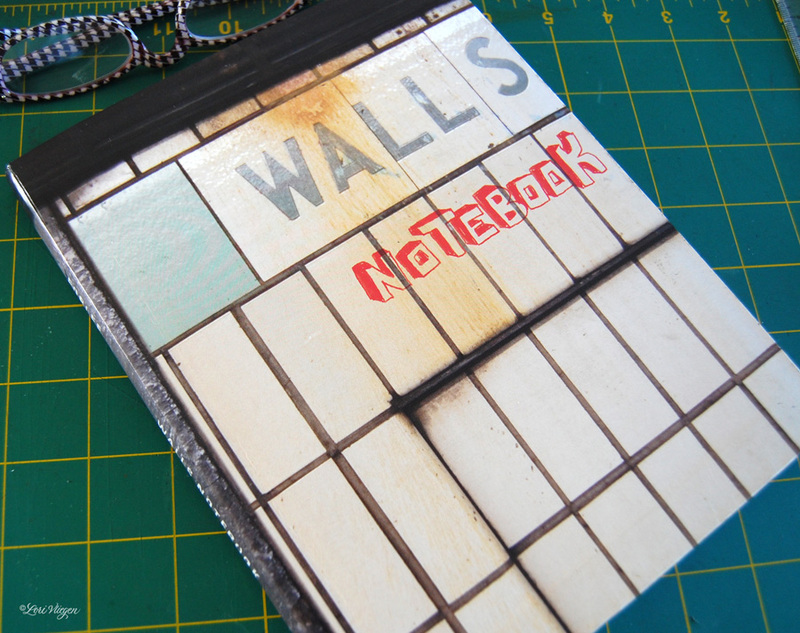 i'm glad that i came across this little book...at one time i had intended to make more of these, and then, of course, became side-tracked with something else. oh, too many things yet to discover! 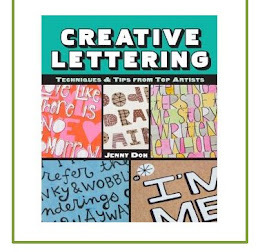 here is another book that i made using some of my lettering artwork on the front cover. my original aceo artwork has been printed on canvas and then stitched to the front cover fabric...and speaking of the fabric, it's probably not the normal "autumn" color combination, but sometimes you just have to go with what you like! 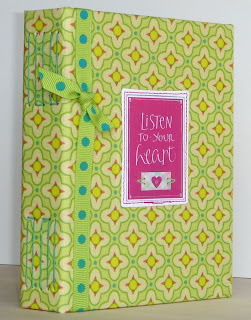 the chartreuse and fuchsia are still hanging in there from the summer, and i think that bright days are ahead for anyone keeping their thoughts in this journal! after going full steam all week, i accomplished a lot in my studio...and i sure have the mess to prove it! i don't really consider myself a messy person, but you'd have good reason to disagree with me if you saw my studio right now. actually, i prefer to think of it as "organized chaos". there are a lot of piles laying around, but it's organized, and i can easily step over each one without falling. it's saturday, and it's a good time to regroup...and on monday i'll be able to walk a straight line through my workspace again. life is good. it's been a while since i've added to my "so true" collection of art cards. i really enjoy working in this 2.5 x 3.5" format and i think it's because my style is more "keep it simple" (although sometimes i think it keep it too simple, but that's an entirely different blog post). anyway, i chose to add this to my series because it occurs to me from time to time that i don't do nearly enough listening. i recently read that it's easy to confuse listening with just waiting for your turn to talk. and, oh yes, i definitely have the talking part mastered. 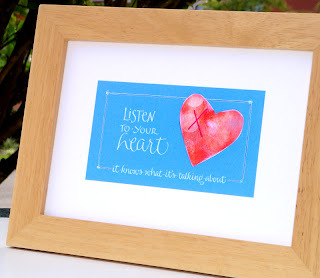 it's the being still and the listening that i'm still working on....especially to my heart. autumn is in the air everywhere...even in north florida! i don't know how long it will be here, but we've had a nice "cool front" come through our neighborhood, low humidity and a nice ocean breeze. 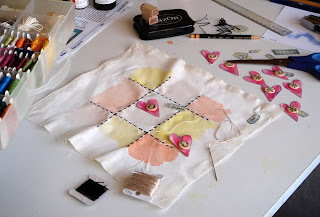 so, autumn inspiration has crept into my studio, and i thought this fabric would make the perfect book to reflect that. construction is the same as the other books that i've made recently. 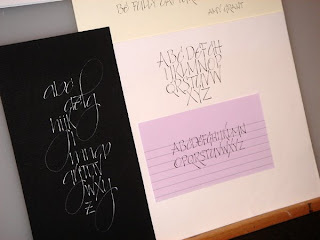 today, i may change gears and get my calligraphy nibs out, mix up some gouache, and get lost in that wonderful sound of putting letterforms onto paper...i'll let you know how it goes. p.s. 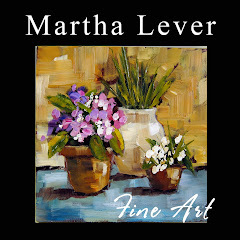 make sure to go to martha's site to see her fabulous collage! !